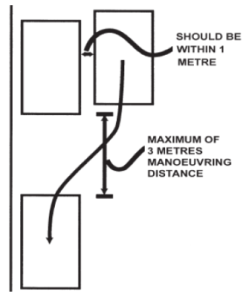 At least one of the manoeuvres will contain a reversing component. You will be assessed on your ability to manoeuvre your car legally, safely, efficiently and accurately. Turn the car around in one smooth forward movement. As close as practical to the road centre, if there is a dividing line and or median strip. A position to the left of the road centre, if no dividing line or median strip. 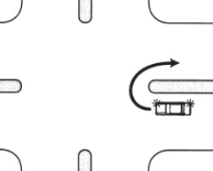 Complete the turn without touching the kerbs. Complete all relevant performance checks during the manoeuvre (e.g. observing, scanning and shoulder checks, and signalling). An error will be recorded if you don’t appropriately manoeuvre and position your car. Being unable to turn the car around in one forward movement. Taking an inappropriate course on the approach to or during the U-turn. Errors may also be recorded for other aspects of your driving, such as signalling, if you don’t meet the requirements of these performance checks during the manoeuvre. Only reverse as far as needed. Park parallel to the kerb. Park as close and as near as practical to the kerb. 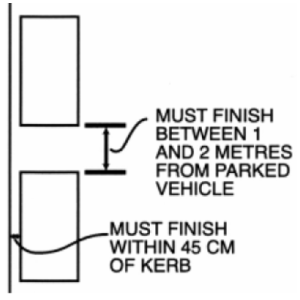 Finishing the reverse park 45cm or more from the kerb or more than 2m from the vehicle in front. Moving further than 3m between the parked vehicle and the front of the car. Reverse in a straight line parallel to and within 50cm of the kerb. An error will be recorded if you don’t appropriately manoeuvre your vehicle. Positioning the car more than 50cm from the kerb during the manoeuvre. An error will be recorded for aspects of your driving performance that don’t meet the requirements of these performance checks when completing the manoeuvre. Turn the car around using the minimum changes in direction necessary (you should not need more than 4 direction changes (a 5-point turn). Unnecessarily requiring more than 4 direction changes (a 5-point turn). Errors may also be recorded for other aspects of your driving, such as speed choice, if you don’t meet the requirements of these performance checks during the manoeuvre.